Spray 3 1/2- to 4-quart slow cooker with cooking spray. In medium bowl, mix stuffing mix, celery, onion and poultry seasoning. Stir in broth to moisten. Stir in cranberries. Spoon half of stuffing into slow cooker. Sprinkle turkey with salt and pepper; place over stuffing. Spoon remaining stuffing around turkey. About 15 minutes before serving, remove turkey from slow cooker; keep warm. Stir stuffing and cooking juices until mixed. Cover; let stand about 10 minutes. Meanwhile, in 1-quart saucepan, heat gravy. Cut turkey into serving pieces. Serve with stuffing and gravy. 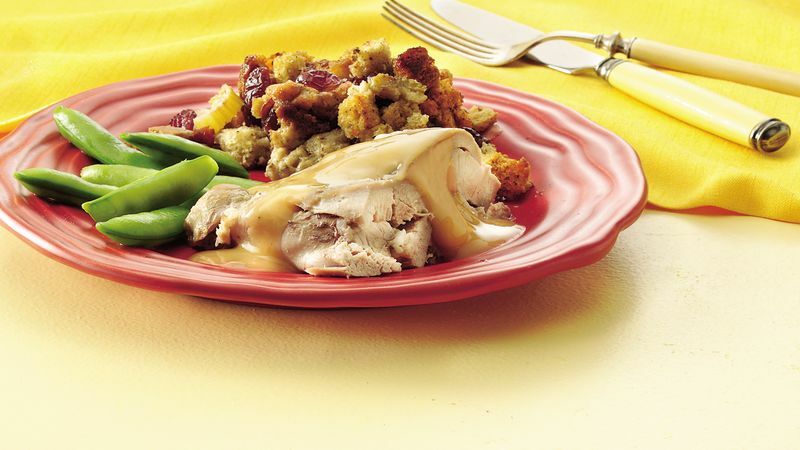 Turkey drumsticks can be substituted for the thighs if they fit in your slow cooker. You'll find that an oval slow cooker will accommodate these larger pieces of meat better than a round one.